Whether you’re a customer, potential customer, or just looking, sign up for iRecruit’s monthly newsletter to see what’s new with us. Find out about the latest updates, news, and available training. 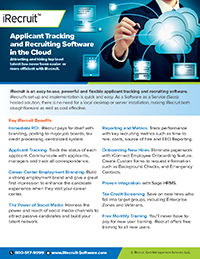 This entry was posted in Blog, iRecruit Blog and tagged applicant tracking software, ats, iRecruit, newsletter, onboarding software, recruiting software. Bookmark the permalink.